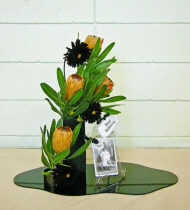 Chiko School is famous for displays of flowers arranged with decorative ornaments and figurines. This results in arrangements which often resemble paintings. Bases of various materials such as mirrors are used and pebbles and sand drawings representing water are also featured. 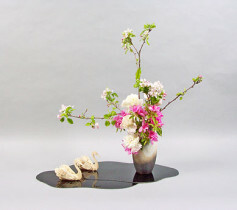 In the beginning, Chiko School taught three classical styles of flower arrangements: Kakubana, Nageire, and Morimono. 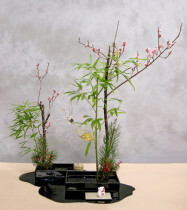 At the present time, Chiko School’s main style is called “Ikebana-Morimono”. With an intention of expressing a characteristic impression, the Chiko School’s Morimono style creates an elegant beauty with a modern sense. 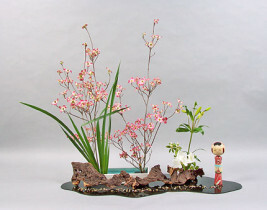 Chiko School arrangements generally include some accessories, such as seasonal fruits or vegetables, ornament, doll, or other artistic or folk object, in addition to the container and floral materials. Sand is often sprinkled at the base, as a way to pull the composition together, giving it depth and feeling. Combining the beauty of flowers with that of these non-floral materials is intended to represent a harmonized refreshment. One of the characteristics of this school is that pleasure from creating beauty can be achieved with a minimum amount of flowers and materials. Kao Naruse, the founder of Chiko School, originated the Morimono style. The current president of the school, Kosen Naruse, is the school’s fourth headmistress. Could you please tell me where I might locate the cloud boards for the Chiko school. I am a member of the International chapter in Sun City Arizona. I would like to know the history of Chiko School. Could you tell me what year it was established by Kao Naruse?